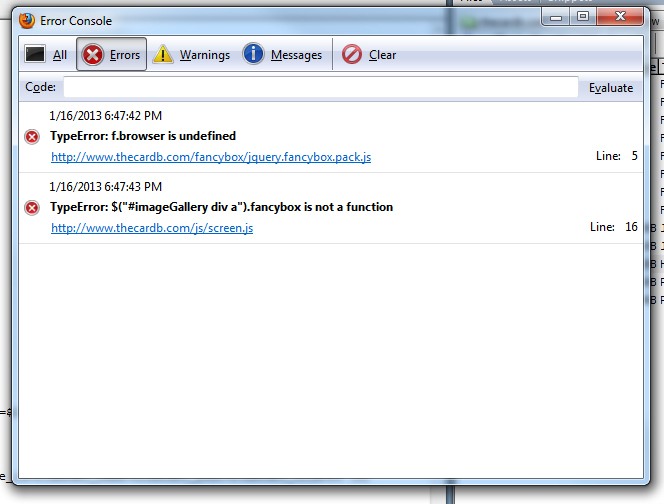 Ok I set some images to open up with fancybox. It used to work fine. Now I get 2 errors. What I changed im not sure. I have read online that you generally get the .fancybox is not a function error message when you have mutiple includes of the jquery library. As far as I am aware I have just the one. I have done some url rewriting, is it a possibility that that is causing an issue? Im lost! Any help is appreciated. jQuery recently upgraded to version 1.9 which removed most if not all of the depreciated methods. $.browser was one of them. Fancybox relies on $.browser, so you can't use jQuery 1.9 and your version of fancybox without the migrate plugin installed. Either downgrade jQuery, upgrade fancybox, or include the migrate plugin. You should also always specify a version number. Not the answer you're looking for? Browse other questions tagged jquery fancybox fancybox-2 or ask your own question. How to configure grunt's usemin:css task to rewrite rev'd images?